Sheena by J. Scott Campbell Statue Keeps Swinging! March 27, Mt. 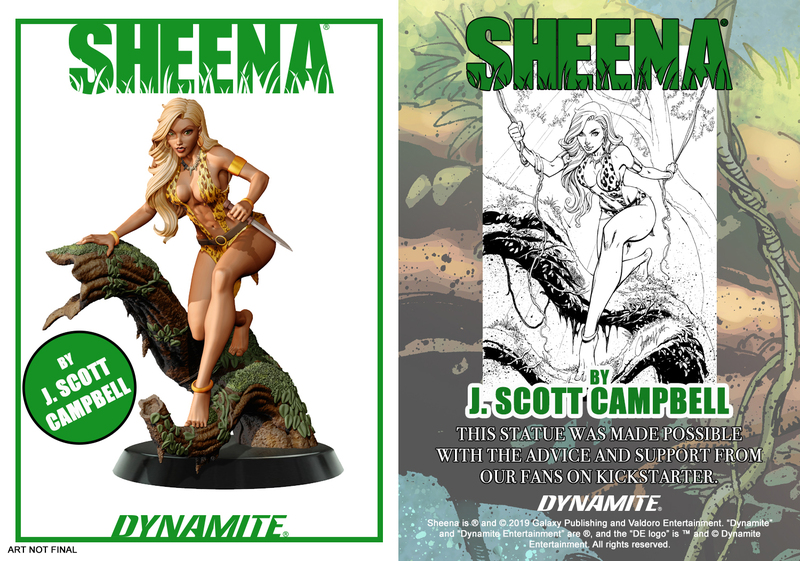 Laurel, NJ: The Sheena statue Kickstarter continues to rise and rise! Not only did Dynamite reach their initial funding goal, but diehard fans pushed past the first stretch goal easily. Dynamite now announces another stretch goal and a killer new reward tier! Don't miss the Kickstarter - Click Here! The next stretch goal will unlock a sweet Ultra Limited Edition pin for all backers getting statues! This miniature enamel version of J. Scott Campbell's drawing will pop in a pin collection or on a jacket or bag! It's a major first as Dynamite's first pin commemorating one of the First Ladies of comic books. The stretch goal is set at $25,000, so fans should make sure all their Jungle Queen loving friends are supporting the campaign! 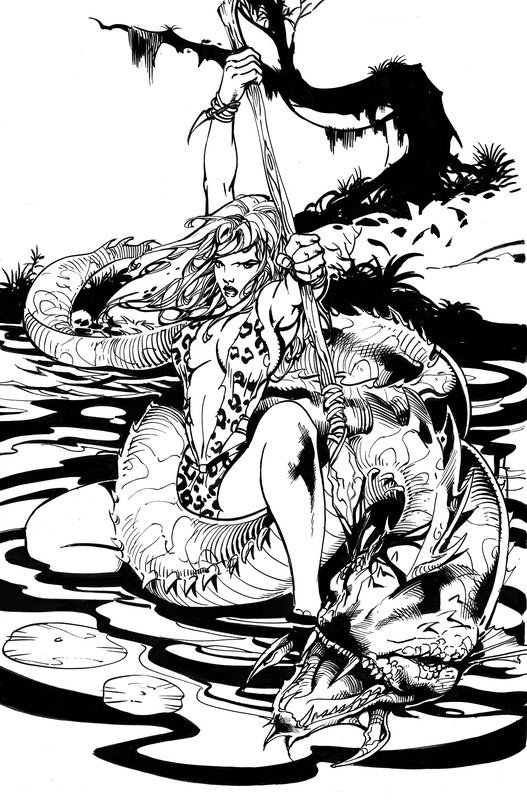 Now at a premium $2,000 level, two lucky fans can secure a mega package of Sheena collectibles. 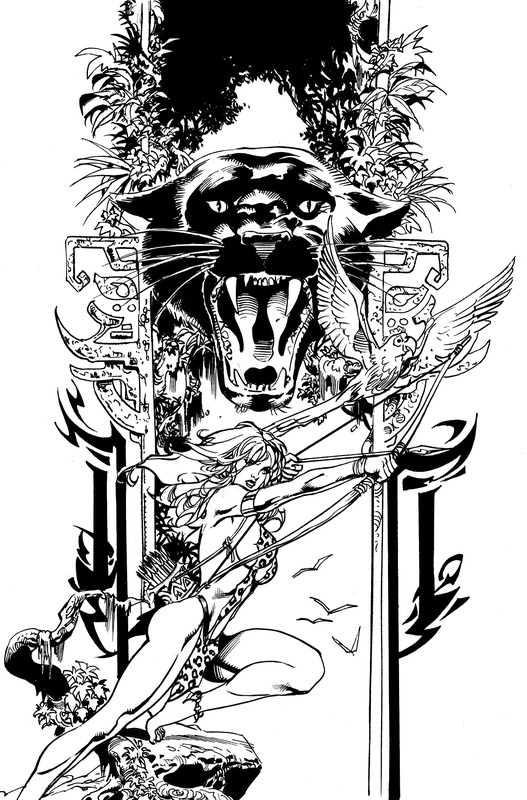 Most exciting is the chance to get two pieces of original comic book art - Roberto Castro's stunning cover images from the Sheena Queen of the Jungle series. 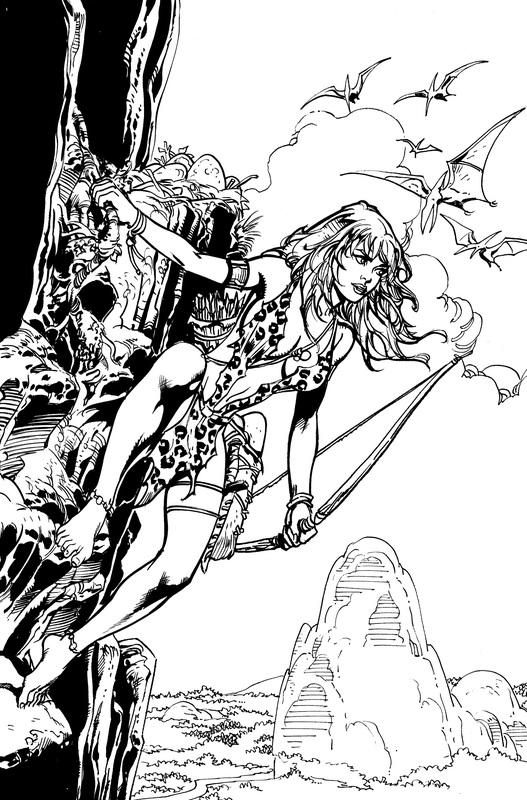 These classic renditions of the original Jungle Girl of comics are the perfect addition to any collection. There is even more though! Also included are two copies of the J. Scott Campbell Sheena statue in the backer's preferred variants, all three print Sheena starring trade paperbacks and "Diamond Eye" variants on the Vampirella, Red Sonja and Dejah Thoris statues based on Campbell's art. All of these pieces are part of extremely limited runs. This deluxe package cannot be beat! Dynamite thanks again all the supporters who helped push past the first stretch goal. To show that gratitude, all statue boxes will now include a premium promotional trading card. One side of the card depicts the 1/6 scale Steve Kiwus sculpted piece that will be joining their collections and the other shows J. Scott Campbell's original iconic line art. Fans supporting the Kickstarter will receive their items early, with bonuses and lower numbers in the run.